Spend a little time in the technology industry and you'll begin to dread December. It's the time when everyone and their grandmother's PR agent invites you to go to an off-floor presentation in Las Vegas to talk about the latest advances in iPhone accessories. ASUS isn't quite that bad, but their CES teaser is a little strange nonetheless. 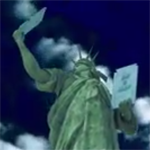 I'm going to assume that the Statue of Liberty in the following promotional video is the one from the New York, New York casino. The "green or blue" imagery is an unmistakable indication of a combination Android and Windows device, which isn't necessarily new in the ASUS lineup - consider both the Transformer Book Trio and the oddball Transformer AiO (all in one). Since Lady Liberty is waving around what looks like a tablet, I'm going to assume that this particular device is more like the current Windows 8/RT and Android tablets than that strange desktop-tablet combination. Then again, she's 300 feet tall, meaning that tablet is at least 30 or 40 feet across. Maybe ASUS is preparing an Android and Windows-powered big screen TV for the billionaire set. CES starts on January 7th, and the ASUS presentation wherein this mystery device will be revealed is taking place the day before. Of course we'll be bringing you the details.